Choices in over-the-counter teeth whitening products are available everywhere these days but none are as effective as the Zoom teeth whitening system for many reasons. The Zoom teeth whitening system is customised to your requirements from the shape of your jaw to the degree of whitening desired as well as it is offered in two methods of administration, namely, in-clinic and at-home treatments. Indeed, brightening your teeth with the professional assistance of the best Zoom teeth whitening Melbourne clinic can prove to be beneficial considering you can see the results within 30-60 minutes! Such is the efficacy of the Zoom teeth whitening system that teeth will be visibly whiter and brighter in just a single treatment session! Physical condition of teeth. Obviously, moderate to severe yellowish teeth will require more than a single in-clinic sessions than mildly yellowish teeth. Keep in mind, too, that decayed teeth with obvious stains are unsuitable for the Zoom teeth whitening system since only relatively healthy teeth with obvious yellowish hue is the main target dental issue addressed by the technology. Choice in treatment. With in-clinic Zoom teeth whitening, whiter teeth of up to 8 shades can be achieved in a single 45-minute session – truly, one of the reasons for the popularity of the Zoom teeth whitening system. With an at-home treatment, similar results can be achieved within 1 to 2 weeks of regular and proper use although it must also be emphasised that actual results will vary based on the concentration and wear time chosen. Which of these Zoom teeth whitening methods of administration is the best? Well, it depends on your needs and wants in terms of your budget, available time, and lifestyle, among other factors. Discuss which of these two choices will work best for your case with the staff of the most reliable and reputable Zoom teeth whitening Melbourne clinic – Healthy Smiles, of course. Desensitisers to minimise the sensitivity of the gums and teeth from the bleaching agent as well as to protect the enamel. In most cases, fortunately, patients will only experience little to no discomfort from the Zoom teeth whitening session since no drilling, among other forms of invasive treatments, is involved. While the in-office Zoom teeth whitening treatment is more expensive than its at-home counterpart – well, at least, from the initial fee paid to the Zoom teeth whitening Melbourne clinic – the benefits of whiter teeth of up to 8 shades brighter more than outweighs the cost. 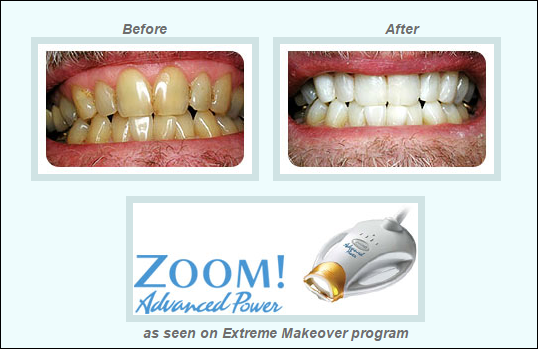 The at-home Zoom teeth whitening treatment comes in two forms – DayWhite and NiteWhite. Both types contain amorphous calcium phosphate, a bleaching agent proven effective not just in the improvement of the smoothness, brightness and lustre of teeth but also in the protection of the enamel and the reduction of sensitivity. Both types, when used in a regular and proper manner, also results in whiter teeth in 2 to 3 weeks although individual results will vary. Just as with its in-clinic counterpart, at-home Zoom teeth whitening treatment is completely customisable. Your cosmetic dentist will create a customised tray depending on the shape of your teeth and jaw as well as on your desired results (i.e., concentration of formula and wear time). What are you waiting for? Get on one of these Zoom teeth whitening treatment types and enjoy the whitest teeth ever!